Whenever you create a piece of jewelry, it is important to try to anticipate how your choice of materials, techniques and technologies might positively or negatively affect how the piece moves and feels (called Support) when worn and how its components maintain shape and integrity (called Structure). Towards this end, it is important to redefine your techniques and materials in architectural terms. Every jewelry making technique is an applied process with the end goal of trying to reach some type of equilibrium. That is, balancing off all the external and internal forces impacting the piece. Achieving this balance means that the piece of jewelry is at its point of least vulnerability. This is where all the materials, techniques and technologies have been leveraged to maximize the four S’s: Strength, Suppleness, Stability and Synergy. I find that most jewelry designers do not learn their techniques with architectural principles in mind. They arrange a set of materials into a composition, and assume its success is solely based on the visual grammar they applied. But if the piece of jewelry doesn’t wear well, feels uncomfortable, gets in a weird position making the wearer look clownish, or breaks or comes apart too easily, the jewelry designer has failed in their mission. Everything boils down to support and structure. Support is anything about the materials or techniques used which allow the finished piece to best move, drape and flow while the piece is worn. 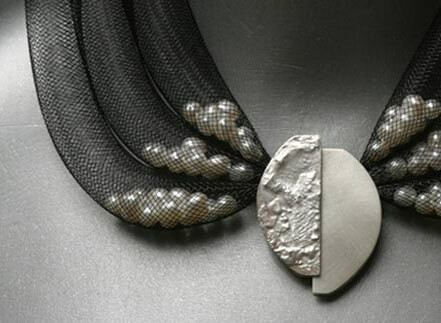 Structure is anything about the materials or techniques used which allow the finished piece to maintain its shape and integrity while the piece is worn. Constructing a bracelet or a necklace is really not much different than engineering and building a bridge. Bridges have purpose and functions. Jewelry has purpose and functions. These are very much the same. The jewelry designer needs to anticipate how the piece will purpose and function within a context or situation or environment, as worn. Designers have to worry about the bracelet maintaining its shape and not falling apart, in the face of many stresses which come from movement, adjustments, obstructions, twisting, body geography and contour, aging of materials, and so forth. They need to anticipate how the piece will comfortably move, drape and flow while worn. They have to construct something that is appealing and friendly to the user. Designers have to be fluent in, and be able to apply, not just a visual grammar, but a functional grammar, as well. This means that the jewelry artist needs to know a little bit about physical mechanics. A little bit about how to create, control and maintain shape. A little bit about how to build in support and jointedness. A lot about materials, how they go together and how they age together over time. 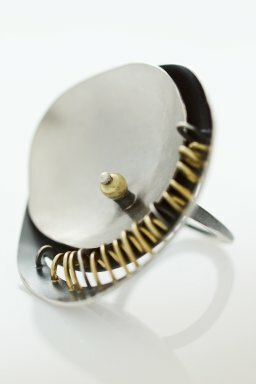 A lot about how various jewelry making techniques enhance or impede support and structure over time. Some comfort about making tradeoffs and judgement calls between aesthetics and functionality. And their finished jewelry needs to reflect all this jewelry artist knowledge, so it maintains its appeal, but doesn’t fall apart when worn. We have all heard and seen the complaints. These things that happen are not natural to jewelry. They are examples of bad jewelry design. They can be corrected by building in an architectural awareness of how materials and techniques function. They may need more support, such as loops, rings, and hinges, for example. 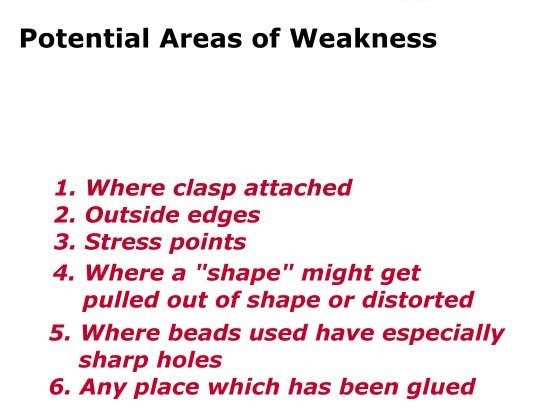 They may need better structure, such as smarter selection of materials, or more strategic implementation of technique, or extra reinforcement at points of potential weakness. This wire work bracelet pulls apart when worn. The jump rings open up. Upon closer inspection, we learn that the designer used dead soft wire to make the jump rings, and did nothing to harden the wire, either before or after shaping. Harding the wire, such as twisting it before shaping it, or starting with half hard wire may have solved this problem. This necklace clasp has slipped to the front. This is not natural to jewelry; it is a design flaw. The clasp assembly has insufficient support or jointedness. This problem can more easily be prevented by building in more support. In this case, adding additional rings – at least one where the clasp is attached to the chain, and at least one to the ring on the other end of the chain – would probably suffice. Added support would absorb the stress movement places on the piece. Without it, the necklace will always turn around in the opposite direction to the force applied. This earring dangle is stuck at a 90 degree angle. The problem is simple. There is insufficient support. This means that either the size of the loop where the dangle connects to the ear wire, is too small, or that the thickness of the wire making this loop is too thick for the opening on the ear wire. 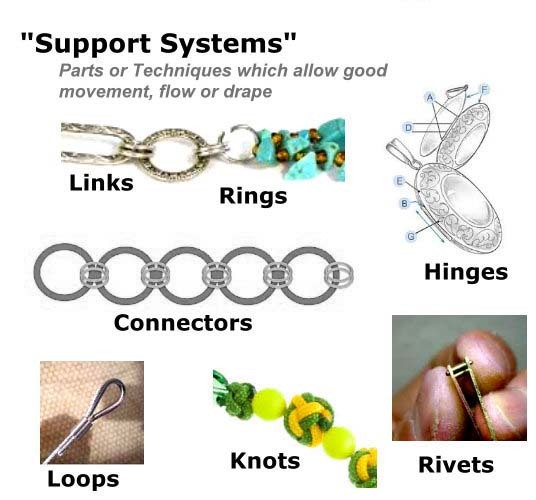 Support systems are components or design elements we build into our pieces, which allow good movement, flow, and drape. This is known as support or jointedness. Sufficient support allows for the absorption or channeling of stress so that negative impacts on a piece of jewelry when worn are minimized. They may involve different kinds of chaining or connecting. I include knots as support systems. Unglued knots provide a lot of support and jointedness. Glued knots do not. Glued knots are stiff, and increase the risk of breakage or support failure. Some knots are looser, like lark’s head knots or weaver’s knots or overhand knots. Looser knots provide a lot of support and jointedness. Other knots are tighter, like square knots and surgeon’s knots, and provide less support and jointedness. Without these kinds of support systems, pieces of jewelry become stiff. When jewelry is worn, movement puts a tremendous amount of force on all our parts. There is a lot of stress and strain on our beads, our stringing materials and other adornments. There is a lot of stress on the clasp assembly. There is a lot of stress on our larger components and forms. If everything is too stiff, movement would force these components to crumble, chip, crack or break. 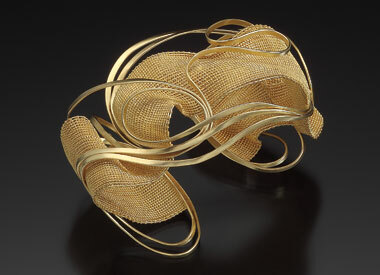 The designer’s choices about clasps, materials, string, technique, and design all affect the success or failure of the support systems integral to their pieces of jewelry. 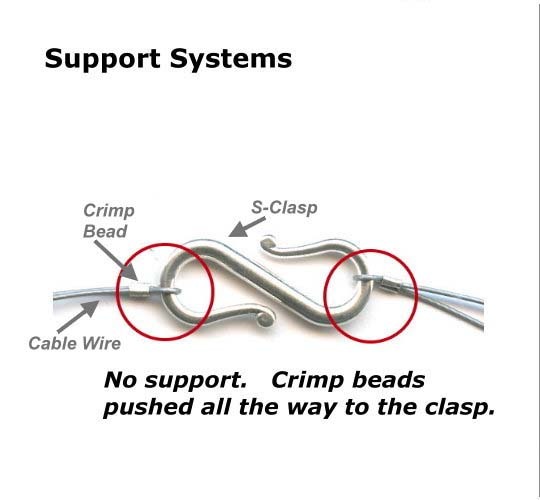 Often, when people string beads on cable wire, and crimp the ends of the wire to secure the clasp, they ignore concerns about support or jointedness. If the artist pushed the crimp all the way up to the clasp, the connection between crimped wire and clasp would be too stiff. It would not allow movement. It could not absorb any forces placed on the piece, such as from moving, pulling, tugging, getting caught on something, and the like. When the connection between wire and clasp is too stiff, the metal pieces will bend back and forth, eventually breaking. In this case, the crimp bead is metal, the cable wire is metal and the clasp is metal. When someone wears a necklace or bracelet where no joint or support is created at the clasp, a couple of things might happen. The necklace or bracelet will start to pull on itself, and as the person moves, and necklace or bracelet moves, and the clasp slides up to the front. 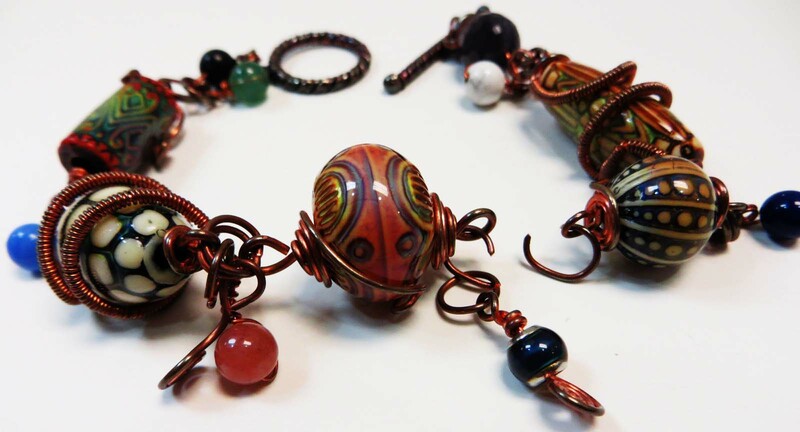 The turning around of the necklace or bracelet is that piece’s response for alleviating the forces of stress. If, for some reason, the necklace or bracelet cannot turn around, then all these metal parts will bend back and forth and break. The better designer, one more familiar with architectural considerations, will avoid these kinds of design flaws which result from leaving an inadequate amount of support or jointedness within the piece. Leaving an adequately sized loop on the cable, as it attaches to the clasp, thus never pushing the crimp all the way up to the clasp, allows for movement and support. When there is sufficient support, in our necklace example, the clasp will always rest securely on the back of the neck, no matter if the wearer is sitting, dancing, or bending forward to pick something up. It will not turn around. It will not break. You will find that most clasps, and most jewelry findings, will need an extra intervening ring – either a jump ring, split ring or soldered ring, in order to have sufficient support and jointedness. 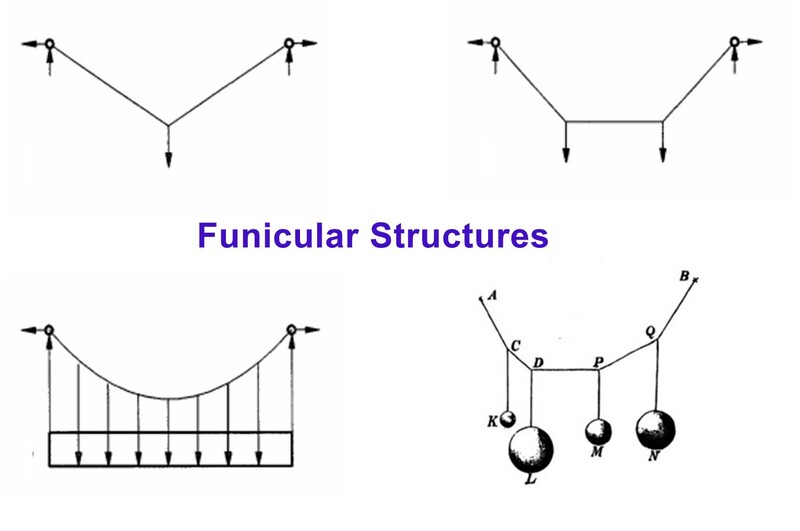 These structures are described in reference to how external forces operate on them. The labels of horizontal, vertical and rotational do not refer to the placement or positioning of these structures, per se. The structures we build into our jewelry help us manage shapes and their integrity as the piece of jewelry is worn. They help us achieve that sweet-spot among the four S’s: strength, suppleness, stability and synergy. Horizontal structures assist us in managing the effects of horizontal movement, such as pulling, tugging, stretching. Horizontal structures are the most common ones we build into jewelry. These include arches and trusses, funicular structures, and nets or webs. Horizontal structures can more easily deflect and deform their shapes in response to adverse forces. They may require adjustments in lengths as requirements for stability might require inward sloping, thus shorter lines, as things get connected closer to the neck, and elongated outer boundaries. Well-designed Trusses and other horizontal structures will distribute the weight and channel the stresses placed on the piece in an equitable way. They will alleviate dead space, drooping, and unsatisfying drape and flow. Horizontal structures designed for strength will allow for more dimensionality, and allow the piece to include arches and puffed out components (vaults). The success of horizontal systems is very dependent on the length of their span. Their ability to adapt to the adverse effects of mechanical forces decreases or increases with their increasing length. As the length shortens, it becomes more important how well these structures can bend. As the length increases, it becomes more important how well these structures can deflect these forces. 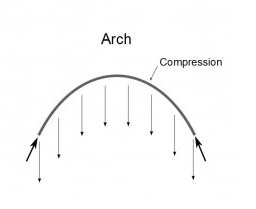 Vertical structures assist us in managing the effects of vertical movement, such as bearing weight or resisting bending. These include things like walls, cantilevers and frames. They may be foundational bases for compositions. They may be a set of wires bounded together to secure them and leverage their properties in the finished piece. They may be bails or connectors for drops or charms. They may be columns. 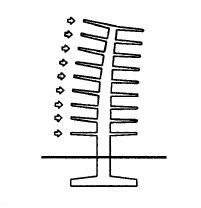 Most vertical structures are characterized by a certain amount of inflexibility, but will vary somewhat in flexibility by type or dimension (width, length, height). With vertical structures, we sometimes worry about shift or drift or bending out of shape. 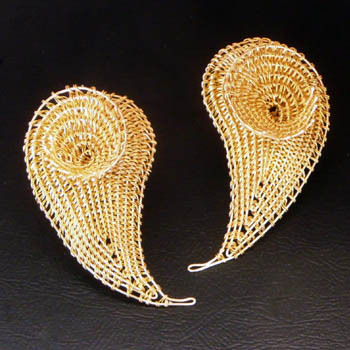 Vertical structures, like Walls, are things which allow jewelry or jewelry components to find a satisfying point of stability between the effects of gravity and the effects of their own weight (loads). This point of stability must hold when the jewelry is static (thus not worn) as well as when it is dynamic (thus, worn). 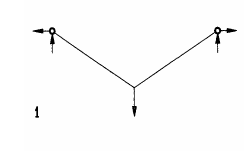 A Cantilever looks and functions like a tree with branches. This vertical structure allows for a lot of bending. 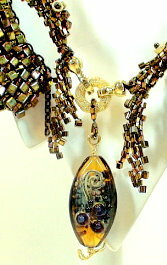 You might visualize a necklace with a lot of charms or pendant drops cantilevered off a strap. The Moment Frame is an additional type of vertical structure which allows for some temporary give and take. The Moment Frame might involve the addition of several support systems, like loops, rings or rivets, and may allow some bending and compression without deformity of the piece. A Braced Frame involves the placement of some kind of diagonal element across a section of the piece, thus bracing two sides at that section. This functions similar to Trusses, and allows for bending and compression without deformity of the piece. Rotational structures assist us in managing the effects of rotational movement, such as twisting, rotating, slipping over or under, or curling. They enable these structures to deform without breaking. Rotational structures can be either horizontal or vertical. What is key is how they are attached. The points of connection are allowed to rotate, temporarily adjusting or bending in shape in response to outside forces, but then rotating back in place. 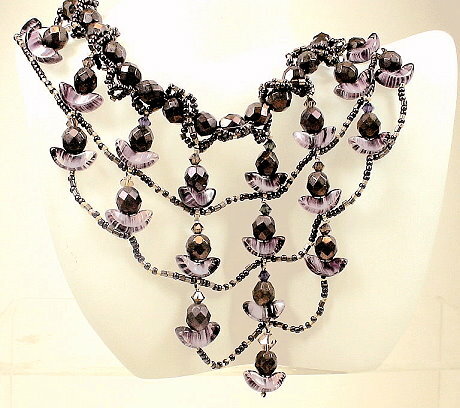 Jewelry designers apply many different approaches to the creation of jewelry. They may string. They may bead weave. They may wire work. They may silversmith. 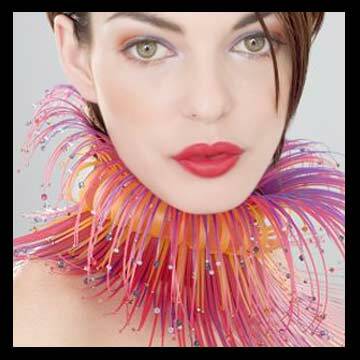 They may work with fibers or glass or other unusual materials to create components and appealing arrangements for people to wear as jewelry. Every technique has, at its heart and the ways it should be best implemented, things which allow it to give jewelry support, and things which allow it to give jewelry structure. Some techniques have a good balance between steps or strategies which support movement, drape and flow, with steps or strategies which structure shape and the maintenance of its integrity. Other techniques are sometimes stronger in one side of the equation, say support, and weaker on the other side, which would be structure, or vice versa. Every technique or design system is an applied process with the end goal of trying to reach some type of equilibrium. Each piece of jewelry is the designer’s effort at figuring out, given the materials, techniques and technologies at hand, how to balance off all the external and internal forces impacting the piece. 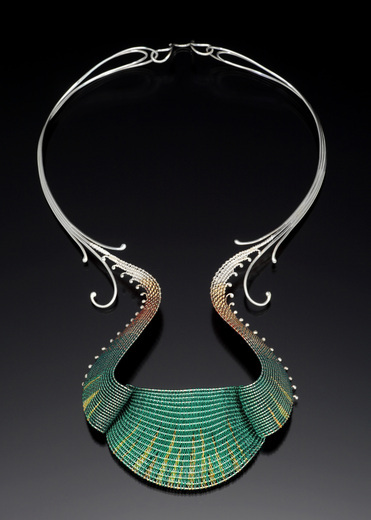 Achieving this balance means that the finished and successful piece of jewelry is at its point of least vulnerability. This is where the materials, techniques and technologies have been leveraged to best concurrently optimize all of our four S’s: Strength, Suppleness, Stability and Synergy. Achieving this balance or equilibrium is partly a function of the materials chosen, but mostly a function of how the designer selects techniques, makes choices about their implementation, and manages support and structure. Every technique will have some steps which require stronger, heavier, firmer, tighter efforts, and some steps which require looser, lighter, weaker efforts. Where the particular steps of the technique are supposed to lend more support, usually the designer will lighten up, and where the particular steps are supposed to lead to greater structural integrity, the designer will tighten up. I find that most jewelry designers do not learn their techniques with architectural principles in mind. They arrange a set of materials into a composition, and assume its success is solely based on the visual grammar they applied. But if the piece of jewelry doesn’t wear well, feels uncomfortable, gets in a weird position making the wearer look clownish, or breaks or comes apart too easily, the jewelry designer has failed in their mission. 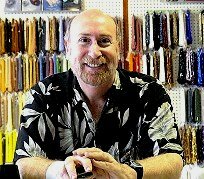 I also find most jewelry designers apply their techniques with the same amount of strength, tightness and tension, rather than learn to vary, manage and control these. This suggests they are unaware of how the techniques they apply result in more or less support, and more or less structural integrity. Let’s explore some bead weaving examples. Bead weaving encapsulates and easily shows how all these support and structural issues come into play. 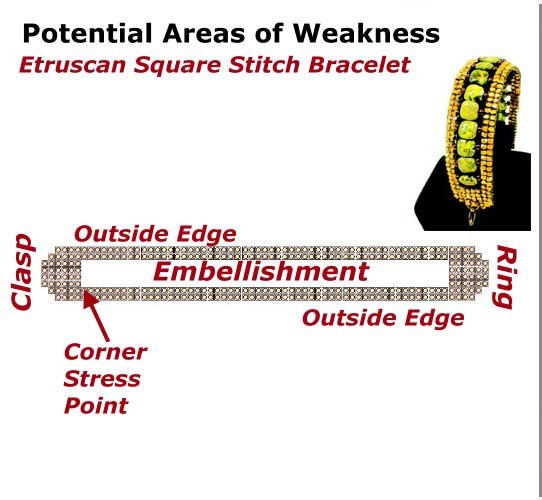 The Tuxedo Park Bangle Bracelet is bead woven using a technique called brick stitch. 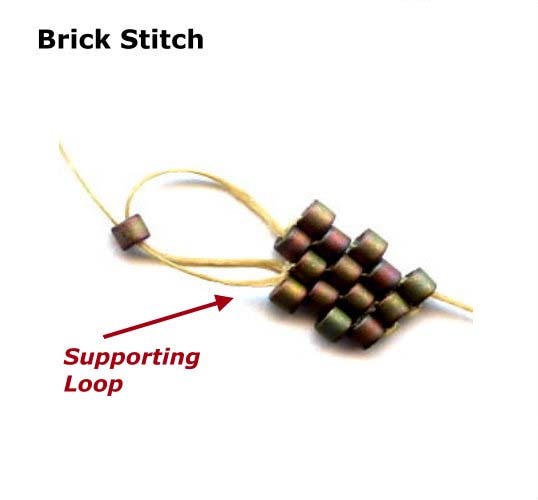 The brick stitch is a very robust bead weaving stitch, in that it allows for a lot of support while at the same time allows for good structure. To phrase this another way, the brick stitch allows the piece to keep its shape and integrity, yet respond to all the forces and stress of movement. The thread pathway of this stitch allows each individual bead to self-adjust in response to stress, while concurrently influencing all the beads around it in how they individually adjust to this same stress. There are two major support systems in this bracelet. The first support system is the thread path design system of the brick stitch itself. 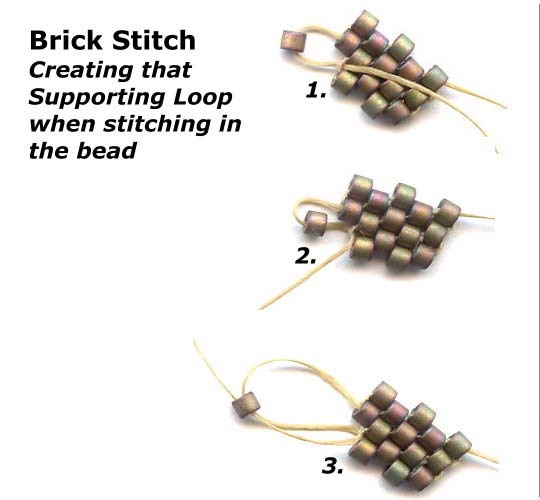 The brick stitch attaches the new bead to the previous row by snagging a thread loop between two beads. This looping not only ties all the beads together within our composition, but also, allows each bead and each row to bend in response to the forces of movement and then bend back into its original position. And, importantly, it allows this flexing all the while maintaining the solidity and shape of our component. The thread-looping pattern of the stitch also allows us to manipulate the flat beadwork into a curve. It allows us to slide and stretch the bangle over our hand and also return to its original shape as it sits on the wrist. It is important, while weaving the brick stitch, to maintain the integrity of the support systems, that is, of each thread-looping-over-thread intersection as best as can be. Anything done which disrupts this looping, will begin to stiffen the joints, so to speak. So, if our needle pierces an existing thread as we create the next loop-connection, this will begin to impede the support, or in a sense, those “swinging” properties of the looping. If we tie off the thread into a knot, such as when we end an old thread and begin a new one, this too will impede support. If we glue any knot, this will end all the support properties at that point in the piece. The second major support system is in the design of the Tuxedo Park Bangle Bracelet itself. We are creating a chain of links. 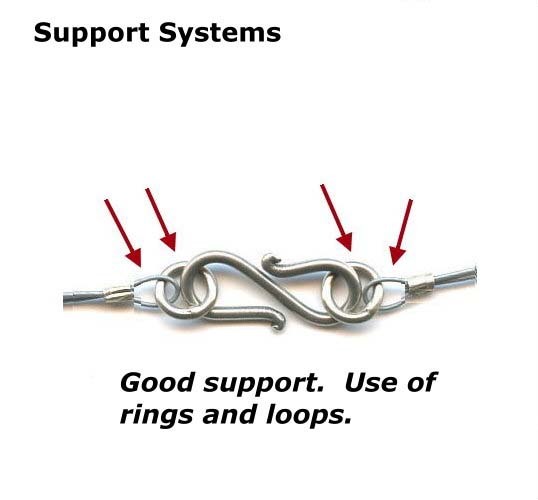 These links or “rings” provide support. That is, they allow the bangle to easily curve around the wrist and to freely move when worn. 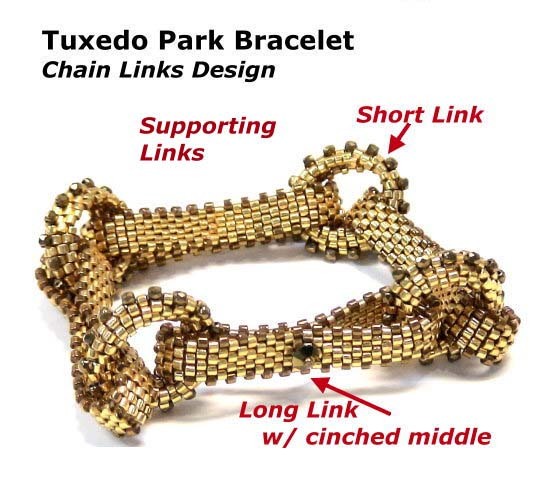 In our long link, we have cinched and sewn down the middle of the link. This begins to disrupt that support in our chain-link. So, we have to be comfortable with the size, thus support, of our now bi-furcated two new ring openings on either side of this cinched long link. If these new openings are too small, one ring would lock into place with the preceding one, making the piece stiff, and thus, uncomfortable to wear, and perhaps putting too much pressure on the parts. 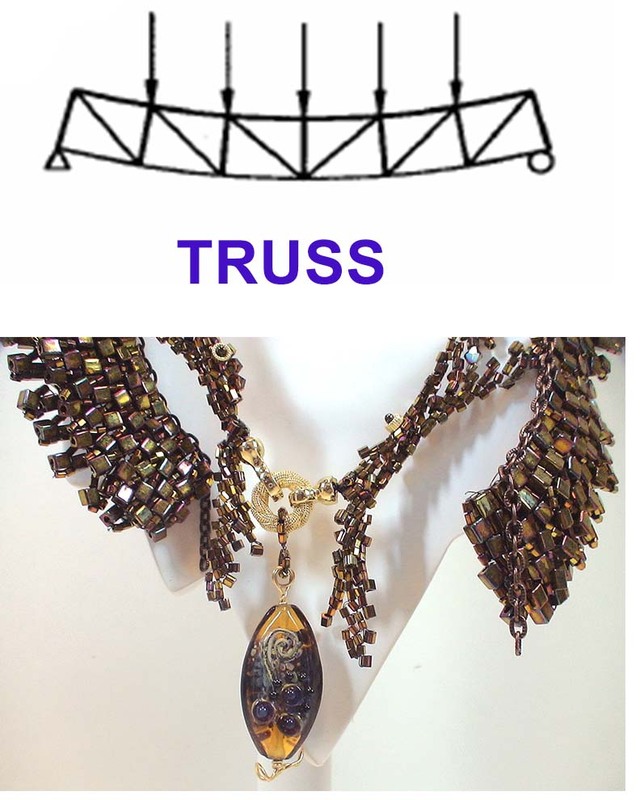 It is important to understand each technique you use, whether a bead stringing technique, or wire working technique, or bead weaving stitch, or silversmithing technique, in terms of how it might enhance or impede support or structure. How might it allow movement. How might it absorb and direct the forces this movement places on our beads, stringing materials and other components within our piece. How it allows the piece to encompass a shape and maintain that shape as worn. 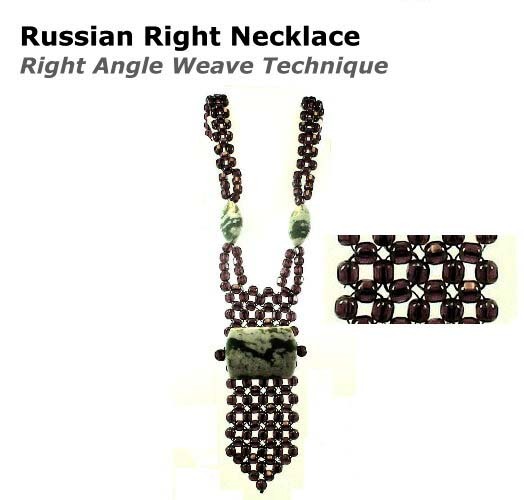 The Russian Right Angle Weave Necklace is an example of another bead weaving stitch which has great properties allowing for both support and structure. The basic right angle weave stitch begins with a circle of 4 beads. It then moves on to create a second circle of four beads. These two circles are linked with one shared bead, common to both circles, and which acts like a hinge. Architecturally, we want each circle of 4 beads – what we call a right angle weave unit, to move in tandem, that is, all at the same time. We want, as well, for each right angle weave unit to be able to influence the movement of all other right angle weave units within the piece, but to also move somewhat independently of all other right angle weave units within our piece. Each unit should move as one. Each unit should be allowed to somewhat self-adjust to stress independently, but at the same time, affect the interdependency of all units within the piece. The right angle woven piece should move like a coil spring mattress. Picture someone lying down on this mattress. Each coil adjusts somewhat independently to the pressure of the body part immediately above it. Yet each coil with the mattress also adjusts relative to the movement of the other coils as well. Nothing gets out of line. No matter what the person laying on the mattress does, or how they move around, all the coils adjust to the changes in weight very smoothly and coherently. 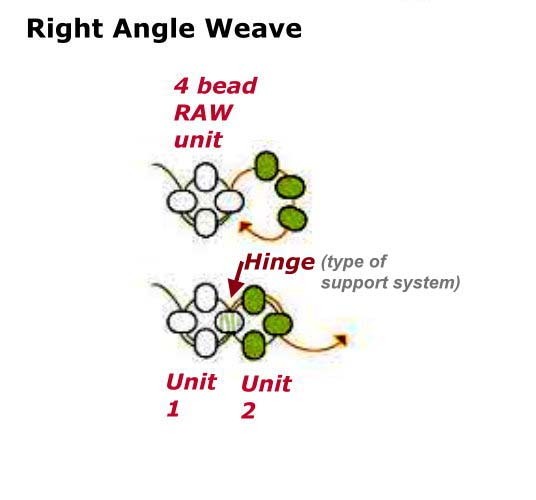 This is how right angle weave works, and maintains itself as a support system. 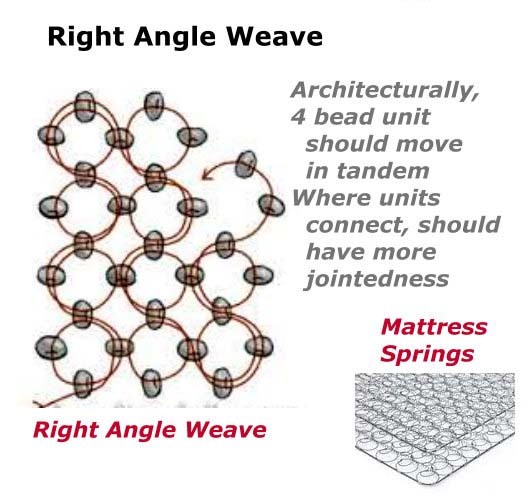 To achieve the optimal performance with right angle weave, the designer would want their four beads within a unit to be as tightly connected as possible, so that they always move and respond to forces as a whole unit. The designer would want a looser tension at the place each right angle unit connects to another at the point of their shared bead. Whenever a project is begun, it is important to carefully anticipate and identify potential areas of instability and weakness. Where might your piece be vulnerable? Where might the forces of movement, when the piece is worn, cause the stringing material or threads or beads or clasps to loosen up, and perhaps break. Or the wire or metal to bend, distort or deform? Most often, places of vulnerability occur where the structures or supports in place take on the shapes of either H, L, T, or U. Think of these shapes as hazards. These shapes tend to split when confronted with external or internal forces. They tend to split because each leg is often confronted with different levels or directions of force. These hazardous shapes cry out for additional reinforcements or support systems. Vulnerability and instability will also occur where the structures or supports are very thin or very soft or very brittle. They will occur at points where there is a slant or a wedge or an unusual angle. Pieces are vulnerable because the jewelry designer has made poor choices in selecting materials, techniques, or technologies, and in managing design from inspiration to execution. REMEMBER: A piece of jewelry results from a Design System. This system is a back and forth process of anticipating how others will judge the piece to be finished and successful, how choices are made and implemented regarding materials, techniques, arrangements and technologies in light of these shared understandings coupled with the artist’s intent. If the piece is vulnerable, then the designer has failed to reflect upon what things will make the piece endure. What will be expected of the piece when the person wearing it moves? As the piece moves from a static place, say from in a jewelry box, and then must transition to the body as a person begins to put it on, what are those transitional issues the piece must accommodate? What parts of the piece must always maintain their shape or position? What happens when the piece has to either shrink, elongate or expand? Does the piece need to bend or rotate for any reason? What happens to all the materials and pieces over time? Jewelry must be designed, from an architectural standpoint, to find a special point of equilibrium. This equilibrium point is a sweet efficient and effective spot among Strength, Suppleness, Stability and Synergy. As our choices force us to deviate from this optimized sweet-spot, our pieces of jewelry become more vulnerable when worn. They are more likely to distort and deform, pull apart, lose tension, and break. To find this sweet-spot for any particular piece of jewelry, we first assess what shared understandings our various audiences will apply when determining if the piece is finished and successful. A big part of this is figuring out how a piece will be worn, how often a piece will be worn, and how long a duration this piece is expected to hold up. The designer assesses all this, then begins to incorporate personal artistic intent into the design process. Strength involves choices we make about materials and techniques which prevent breaking. For example, a well-done soldering joint or correctly crimping to secure a clasp to cable wire, would increase the strength. Suppleness involves choices we make about materials and techniques which maximize elasticity and flexibility. For example, the addition of intervening rings to various jewelry findings would increase suppleness. Stability involves choices we make about materials and techniques which prevent deterioration, malformation or collapse. 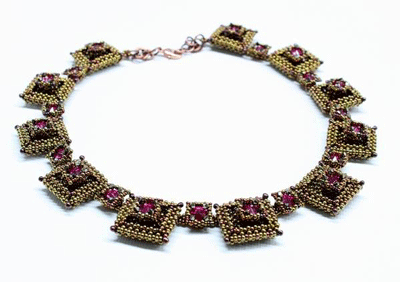 For example, we might reject coated beads for a project, or might use a multi-strand rather than a single-strand clasp for a multi-strand piece of jewelry. We might add extra reinforcement to the ends and the corners of pieces. Synergy involves choices we make about materials, techniques, and technologies which not only reinforce our design, but also increase, enhance or extend the design’s appeal and functionality. For example, a tight clustering of beads into an attractive pendant drop might be many times stronger, more supple, more stable and/or more appealing than any one bead alone. A necklace, or any type of jewelry, has a structure and an anatomy. Each part has its own set of purposes, functions and aesthetics. Understanding each type of structure or physical part is important to the designer. 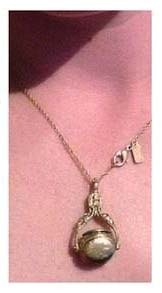 If we looked at these sections of a necklace from solely an art standpoint, we might primarily focus on the centerpiece of the jewelry and consider The Strap (and most other parts) as supplemental to the piece, in a similar relationship as the frame to a painting or the pedestal to a sculpture. 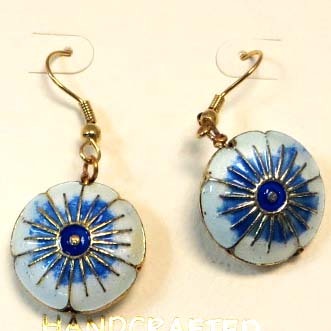 However, jewelry is a 3-dimensional object serving both aesthetic as well as functional purposes. As such, we need to be more sensitive to the entire jewelry-anatomy and both its art and architectural reason for being. The Break: The point where The Yoke connects to The Frame, often at the collar bone on either side of the neck. Very often, this point is one of a critical change in vector – that means, the angle The Frame lays radically changes from the angle of The Yoke. Think of this as an inflection point. The Strap is that continuous line that extends from one end of the clasp to the other. The Strap may or may not consist of the exposed Canvas. The Strap typically delineates a silhouette or boundary. This usually sends the message to the viewer about where they may comfortably and appropriately place their gaze on the wearer’s body. The Strap is a type of funicular structure. A funicular structure is one where something like a string or chain or cable is held up at two points, and one or more loads are placed on it. Loads increase tension. Loads lead to compression. The placement can be centered or off-centered. If more than one object is placed on The Strap, each object can vary in mass, volume and weight. We do not want The Strap to break because of the weight or placement of any load or loads. We do want to control the resulting shape of the silhouette or curvature of The Strap which results from the weight or placement of any load or loads. The Yoke is one section of the Strap which is the part around the back of the neck, including The Clasp Assembly. The length of The Yoke, and whether the beginning and end parts of The Yoke should be exposed on the front of the body is something to be determined by the designer. The designer must also determine the proportional size of The Yoke relative to the remaining part of The Strap. The designer must determine what role the elements, such as beads, which comprise The Yoke, will play, and whether they should be an active part of the visual composition, and/or a critical part in the functional success of the piece, or merely supplemental. The Yoke balances the load requirements of the remaining Strap, Bail and Pendant. At the point The Yoke connects to the remaining Strap (called The Break leading to The Frame) on either side of the neck, this is a point of vulnerability, often assisted and reduced with the addition of support elements. Because it is at this point – The Break – where The Strap may alter its vector position in a dramatic way – that is, the angular positioning of the Strap at the point of The Break may vary a lot as The Strap continues around the front of the body – this is a major point of vulnerability. There are always transitional issues at The Break. The designer needs to have strategies for managing these transitions. This might involve using visual cues and doing something with color or pattern/texture or rhythm or sizes. The designer must decide the degree The Frame should be visually distinct from The Yoke. The Clasp Assembly is part of The Yoke. The Clasp Assembly includes, not just the clasp itself, but also all the other parts necessary to attach it to the Strap. There might be some additional soldered rings. There might be loops left at the ends of the stringing material. There might be crimp beads or knots or glue or solder. 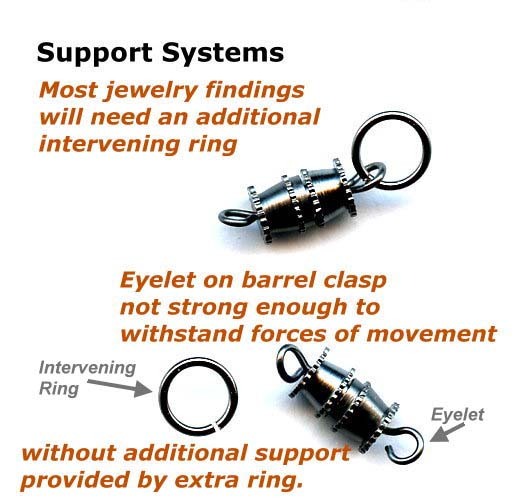 Whenever choosing a clasp, it is more important to think in terms of choosing a clasp assembly. You might want to use a very attractive clasp, but it may take so many parts and turns to attach it to your beadwork, that you end up with a visually ugly clasp assembly. The Frame is that part of The Strap which connects to either side of The Yoke at The Break. Too often, when the designer does not recognize the Yoke as distinct from The Frame – even if the transition is to be very subtle – less-than-satisfying things happen. Proportions may be off. The piece may not lay or sit as envisioned. The Strap may have too much embellishment going too high up The Strap. Sometimes the balance between Yoke and Frame is off – too much Yoke and not enough Frame. The change in vector angles between The Yoke and The Frame may pose many architectural issues for the designer. 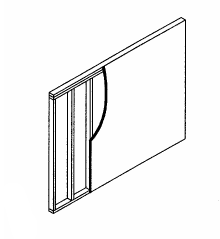 Bi-Furcated Frame: A Frame visually split in half, usually at the center and in two equal parts, with a centerpiece focal bead or pendant drop in the middle. While not every necklace has a focal point, centerpiece or pendant drop, most do. The Focal Point gives the viewer’s eye a place to rest or focus. Sometimes this is done with a centerpiece pendant. Othertimes, the centerpiece is more integrated with The Strap. This can be created by graduating the sizes or beads or playing with color or playing with rhythm or playing with fringe. A Centerpiece would be a part that extends beyond the line of The Frame, usually below it, around it, or in front of it. This forces transitional concerns between it and The Frame. There should be a natural transition from The Strap to The Focal Point, Centerpiece or Pendant Drop. The Bail is a part that drops the Centerpiece below the Frame, forcing additional transitional concerns among Centerpiece, Bail and Frame. We are concerned about its impact on emphasis, harmony, balance, distribution of size and proportion, point, line, plane and shape. We are concerned about its ability to maintain stability, given the effects of gravity, the weight of the drop, and its relationship with and fit to The Frame of The Strap. Most Bails would be considered vertical structures. The Canvas typically refers to the stringing materials. However, in a layered piece, may refer to any created “background or foundation” off of which or around which the main composition is built. It is important to know what The Canvas is made of, and how its function and appeal might improve or weaken as its Span is lengthened or shortened, widened or narrowed. The steepness of its slope or positioning might also affect its integrity. Sometimes more than one Canvas are interconnected. 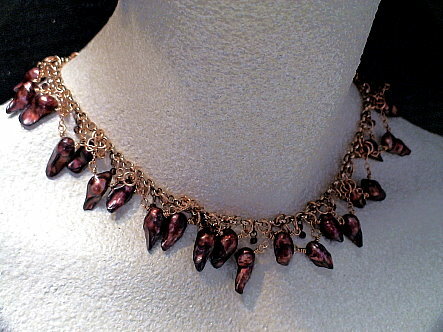 You can picture a necklace with additional strands crossing the chest from one side of The Strap to the other. 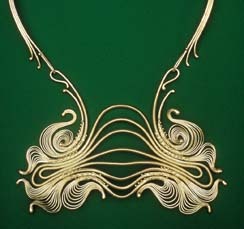 You might also have a necklace where strands radiate out at angles from the neck and across the chest. Architecturally, additional Canvases which span from one side to the other of a piece of jewelry operate like Trusses, Arches or Support Beams. These types of structures are referred to as Horizontal Structures. The Embellishment includes things like fringe, edging and surface decoration. Embellishments are decorative elements added for purposes of improving the visual appeal of a piece. Embellishments typically do not play any support or structural roles. Mechanics represents the behaviors of the jewelry when subjected to the forces which arise when wearing a piece. These forces include movement. They include pulling, tugging, bending, stretching, realigning, readjusting, bearing weight, carrying weight, securing weight, brushing against, rubbing against, curving and taking the shape of the body, loose- to just-right- to tight-fit, positioning, repositioning, and the like. Statics are descriptions of jewelry behaviors when that piece of jewelry is on the body, but at rest. Dynamics are descriptions of jewelry behaviors when that piece of jewelry is on the body, and the body is in motion. Forces are external to the piece of jewelry. Stresses are internal to the piece of jewelry. Strains result from the deformation of the jewelry, as it responds to either external forces or internal stresses. As jewelry designers, we want to understand jewelry mechanical behaviors in terms of our 4 S’s. We do not need to go into any of the math here. We primarily need to be aware of the kinds of things we need to think about, manage and control. Some of these things will be forces external to the materials and construction of our piece of jewelry. Other things will be internal stresses within our piece of jewelry. Our jewelry will strain to respond to either forces or stresses or both, until it can strain no more and it loses its shape, breaks or otherwise becomes unwearable. 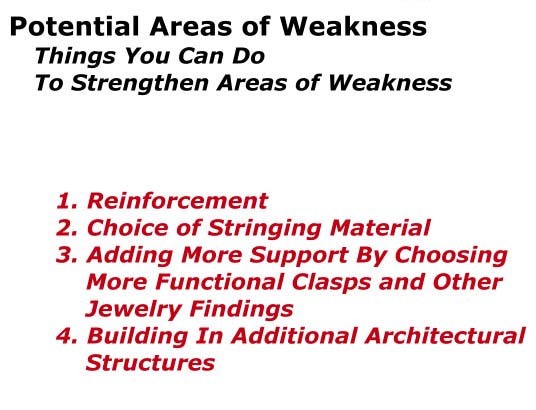 We want to anticipate jewelry mechanical behaviors at the points of (a) maintaining shape (strength), (b) maintaining comfort (suppleness), (c) maintaining position or placement (stability), and (d) right at that point where all the materials, techniques, and technologies are leveraged to their full effect (synergy). What about our choices of materials, techniques or technology leads us to design jewelry which mechanically achieves these points of equilibrium of forces? What about the structures we use and the support systems we build in allows us (or prevents us) from achieving this point of force equilibrium? 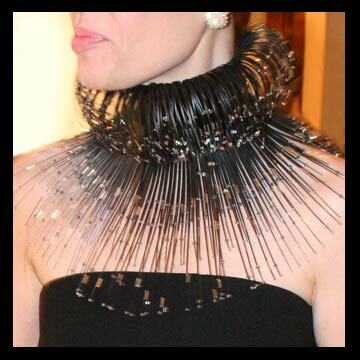 The fluent jewelry designer can think about art and about architecture and context. He or she can be able to anticipate the types of issues that arise, and the types of solutions that might be available. And he or she can evaluate and reflect upon the choices and successes or failures. Jewelry takes quite a beating when worn. We want it to hold up. We don’t want it to break. We don’t want it to stretch out or distort or deform. We don’t want the materials we use to fail, such as the finishes fading or rubbing off, the material cracking, or the material becoming too brittle or too soft relative to how it should function in the piece. We do not want the individual components to shift positions, or inadvertently glom on top of each other. We want the jewelry to make the person wearing look good, feel good, and get that sense of connectedness they seek when wearing a piece of jewelry. The architecturally-sensitive designer will design for strength, suppleness, stability and synergy. The forces affecting these can be very complex. They might depend upon or vary based on physical dimensions (width, length, height and depth). They might depend upon or vary based on environmental considerations, such as cosmetics, perfumes, body oils, pollution in the air, or certain chemicals in someone’s sweat. And of course they are dependent and may vary based on anything that causes movement or prevents movement, such as the movement of the wearer, the wind, getting something caught on something, brushing against something, twisting, bending, shaking, and the like. Jewelry is both art and architecture, and must be thought about and implemented as such. It is always important to remember to think about any technique applied as a design system. This design system will include the characteristics of the materials used, the strategy for implementing the technique, the technology incorporated into the process, support and structure, and finding equilibrium among the 4 S’s. The design system is a process that is to be managed and controlled by the jewelry designer, in line with assessments about shared understandings and artist intent. It is always important to visually and functionally specify how the design incorporates support. It is always important to visually and functionally specify how the design incorporates structure. And it is always important to remember we want to achieve a point of equilibrium among the four S’s: Strength, Suppleness, Stability and Synergy. …if one is to be fluent in design!